Instant Coffee Wisdom – Page 11 – A coffee expert shares wisdom and advice on being successful. It’s the most wonderful time of the year, and the average consumer tends to blow their budget to smithereens as they get carried away by the holiday cheer. Each year Christmas spending has been increasing, usually prompted by Black Friday and Cyber Monday sales. This is good news for retailers whose profit earnings during the Christmas season can be significant, up to and even exceeding half of their annual profits. Christmas is big business, but it can land consumers in the poor house. Haunted by ‘The Ghosts of Christmas Past’? According to The American Research Group Inc. the average American spends almost $1000 on Christmas gifts. If you add other seasonal expenses like decorations, food, and expenses associated with traveling to visit distant friends and family, the amount can easily skyrocket. Most of this is rung up on plastic. Let’s not forget about charitable donations either. How much pocket change did you throw in the Salvation Army Kettle each time you passed a bell-ringer? Till it’s all said and done, the end-of the-year shopping spree spreading Christmas Cheer is followed each January by the real ‘Ghosts of Christmas Past’ – the credit card bills! At the end of A Christmas Carol Ebenezer Scrooge learns the true meaning of Christmas. You don’t have to go overboard and be a miser to avoid the consumer trap, you just need to plan a budget and stick to it. ‘Everyone’ doesn’t get a gift. ‘Everyone’ gets a share of the pot. I’m not a fan of cutting people out because I feel mistreated or cheated. Everyone we know is facing some inner turmoil we know nothing about. If someone gives you a gift, you don’t have to automatically reciprocate with an equal or even more expensive gift. Just say ‘thank you’. A gift is a gift, not an obligation. I have almost a thousand regular customers at my day job. I treat them all the same. A very small few give me Christmas gifts. I don’t expect anything from them, but I always thank them. I know that in many cases, some of my elderly customers are on fixed incomes and have very little money. I worry about accepting gifts from them, and I sometimes ask ‘are you sure?’ or state that they ‘didn’t have to do that’. It’s rude to refuse a gift. Be grateful, smile and thank them. They appreciate it far more than you know, and it costs NOTHING to be kind! I budget for Christmas. I have a set amount ear-marked for the season, and I stick to that limit. Everyone on my list gets something, even if it’s only a card. It’s the thought that counts. I mail out almost 50 cards, each with a printed annual newsletter. It’s an expense, but I enjoy doing it. I have not been able to see some of the people on my list in years because I am so busy, and they are busy, and our schedules don’t mesh. A Christmas greeting in the form of a card and newsletter is a nice way to let people know you still care. Only about 20% of them mail me a return card, but that’s okay. Gifts are gifts, no obligation remember? Always consider that just because you like something doesn’t mean everyone will like it. Take fruitcake for example. Some people think it makes a great gift. Others feel it’s great for propping open the door. Some people have food allergies or special diets. Some parents don’t allow certain toys. NEVER GIVE PETS AS GIFTS! Give cash or gift cards and let the recipient purchase what they really want. During the Great Depression, banks first started the idea of seasonal savings accounts earmarked for Christmas. These are still offered by some financial institutions. In many cases you can even arrange for automatic payroll deductions to make saving for even Christmas easier. Christmas Clubs usually send out checks or electronic bank deposits of the entire amount at the end of October, in plenty of time for Christmas. Children do not understand gifts of socks and underwear. I grew up poor, and Christmas was about getting toys. Very few children have the understanding and level of maturity to understand that they may be poor, and don’t get why ‘Santa’ didn’t bring them a Red Ryder Carbine Action 200-shot Range Model air rifle, opting instead for much needed clothing. I was always disappointed by clothing. I also had too many toys. I didn’t play with the ones I had, or need new ones. I don’t have kids, but let me tell you, if I did they wouldn’t be spoiled with showers of toys. Yet each year, I see friends and relatives spoiling their kids. Some elderly people have a dozen or more grandchildren. They can’t afford a gift for every grandchild. If there is some special must-have toy that is quite expensive, consider pooling resources, and just labeling the one gift ‘From Santa’. Instead of buying gifts, throw a small dinner party. I do this each year for a few close friends who live local. Arrange party games and take pictures to make it memorable. Maybe there is nothing in the store they need, but what about some token of love? Bake Christmas Cookies, or give a handmade gift like a decorated mason jar filled with coffee or cocoa mix, or a handmade ornament. Send cards to let them know you care. What about just love itself?, Share friendship, understanding, consideration, a helping hand, a smile, and a prayer. You can’t buy these things in any store , but these things are what people need the most. As always I wish you happiness and success! And God bless us, everyone. Author instantcoffeewisdomPosted on December 3, 2017 Tags Budget, Christmas, coffee, debt, finance, happiness, money, self help, self improvement, successLeave a comment on Deck the Halls! Is there ‘too much month at the end of the money’? If you’ve been paying attention so far, I’ve already touched on the importance of having an emergency fund and avoiding credit card debt in earlier blog posts. There is a reason for these two steps being essential as part of any successful plan to get out of debt. An increasing percentage of the populace lives paycheck to paycheck, lacking an emergency fund, and using credit cards to fill in the gap. This is a recipe for disaster. You cannot spend your way into prosperity. The first thing you need to understand is that you and you alone are in control of your finances. The responsibility belongs to you alone, and if you have chosen to shirk this responsibility your finances will be in total chaos. Now is the time to take action and learn to budget. A budget is a saving plan. It is not ‘punishment’, but if your finances are out of control and you’re living beyond your means, you will need to budget very tightly and stick to the plan to break the cycle of debt that you have fallen into. The good news is that it is possible. The bad news is that it will take time and effort, but I promise that if you do the work, it will pay off in the end. Does your job pay enough for you to live on? Your paycheck is your biggest source of wealth. Social welfare programs trap you at the poverty level by doling out a meager subsistence and they should be avoided as a main source of income, preferably avoided altogether . Likewise, extra money earned from a second job, or from working overtime should not be essential to make ends meet. If you are starting out in a position of debt, you will need to increase your regular income stream in addition to budgeting. Trust me, I know from experience. Due to a series of unfortunate events from December of 1999 through January of 2002, I ended up $50,000 in debt, and it took 8 years of budgeting and working all the overtime I could endure to erase that mess. Overtime was extra income, earmarked for the specific purpose of eliminating my debt. It was never considered part of my regular monthly expenses. I have too many coworkers who have trapped themselves into working mandatory overtime just to make their monthly expenses. This is a terrible way to live. Do you get paid on Friday, only to be broke on Monday, wondering where your paycheck went? Successful people work from a list and write things down. Get into the habit of tracking your spending, because you’re spending way more than you realize. Write down everything you spend, and always ask for a receipt. If a receipt is not available, (like buying a soda from a vending machine) jot down a quick note and create your own receipt. Organize your receipts and record them in a journal of some sort listing the date, the store, the purchase, the amount, and the method of payment. You don’t need a fancy financial ledger for this purpose, I recommend a spiral-bound notebook. I buy these on sale at my local Wal-Mart during the back-to-school sales by the dozen, usually for the low price of just 25¢ each! Track your spending for about at least a month or two to get an accurate account of where your money goes. After this initial period, continue tracking your spending to see how it lines up with your budget. After you’ve collected your initial spending data break it down into categories. Living expenses 50% total– Housing 25 to 35%, Utilities 5 to 15% (heat, light, phone, maybe internet and cable but those last two are questionable necessities ), Groceries 5%-15%, Transportation 5 to 10% (Bus/train fare, or parking fees, tolls if any, and gas.) You’ll need to adjust those four sub-categories based on your individual circumstances. The combined total cannot exceed 50% of your income. A great way to organize your spending categories is to use the envelope system. Divide your cash into the various categories using the suggested percentages. This is all the allotment for each category. When the envelope is empty, you have no money for that expense. If at the end of the month there is unused money in any envelope, put it into an EXTRA CASH envelope, and save this for emergencies. First rule of Budgeting – 50% of your income MUST be able to cover 100% of your living expenses. This is absolutely essential! If you get paid bi-weekly like most people, you average 2 paychecks a month, and one of those paychecks should be able to fully cover your rent, utilities, groceries, transportation, medicines etc. If you can’t achieve this with your level of income, I’m sorry to say you’ll need to find a better paying job, or cheaper living accommodations. Living in your parent’s basement forever is not a viable option either. You need to stand on your own two feet. Man up! Third Rule – Did you notice I didn’t include contributions to a 401k Retirement Plan in the two rules? That’s because you should be contributing 10% of your salary to one automatically BEFORE you even get your paycheck, and this should never ever be thought of as part of your budget. You don’t consider any other payroll deductions like taxes or FICA as part of your budget, and you should likewise think of a 401k contribution as just another in the list of payroll deductions to your check before you even get paid. If you don’t plan for your future, you won’t have one! Get into the habit of paying cash for everything! Credit cards are a tool, and can even offer benefits like cash back, but it’s way too easy to overspend and blow your budget due to impulse spending. Using cash creates a visceral reaction that credit cards lack. You really weigh your spending decisions when you leave through the dwindling banknotes in your wallet. If you elect to use credit cards for payment, you should be fully prepared to pay the balance in full each month. Paying interest is like throwing away money. If you lack the discipline to keep your spending in check, eliminate the temptation and get rid of those cards now! You’ll be happier in the long run. As always I wish you happiness and success! Just double $1000 ten times! There are over 6 billion people on Earth. John D. Rockefeller became the world’s first official billionaire in 1916 as a result of his ownership of Standard Oil. Just over a century later, there are now 2,043 billionaires in the world as of 2017 according to Forbes Magazine. This means the odds of the average person becoming a billionaire are quite slim, almost non-existent. However, according to a 2016 report by global consultancy firm Capgemini there are around 16.5 million millionaires in the world! A million is one thousandth of a billion, but it’s still a large number and you’ve got a far greater chance of joining the exclusive ‘7 Figure Club’ especially if you are fortunate enough to live in the USA, the Land of Opportunity and home to 10.8 million millionaires. The current population of the United States of America is 325,316,130 as of Tuesday, November 14, 2017, based on the latest United Nations estimates. With that in perspective the odds of a US citizen becoming a millionaire are roughly 1 in 325. So what’s stopping you? A few blogs ago, I covered the Rule of 72 and the miracle of compound interest. If you take $1000 and double it ten times you end up with $1,024,000! Initially the compounding effect barely registers on the above graph, only to skyrocket at the sixth doubling. Putting off retirement saving until your 30’s or 40’s practically destroys your potential retirement nest egg! Coincidentally, (or not) both Dave Ramsey and Tony Robbins each have a chart in their books showing the effects of compound interest on the life savings of two friends. I’ve even seen several other versions online. The names, ages, and savings amounts are different , but the end results are the same. The person who started saving for retirement earlier always invests significantly less money, yet beats the friend who starts later and invests much more. The first time I saw this it blew my mind, but it illustrates the importance of saving for retirement early in life. According to almost every financial expert I’ve consulted, you’re going to need a minimum $1,000,000 to retire comfortably. It is possible for ANYONE to attain this goal provided they begin investing at the earliest possible age. Dave Ramsey has his version of the aforementioned chart in his book Financial Peace on page 120. The Tony Robbins version appears on page 24 of his book Unshakeable. I’m going to use Robbins’s version, because it has a larger annual investment. The assumption is $3600 invested per year, with 10% interest. Basically, Joe and Bob are both the same age . Joe begins investing $300 in the stock market every month from age 19 to 27, saving a total of $28,000 and then he decided to quit saving altogether and let it sit and collect interest. Bob doesn’t even start saving until he’s 27 but keeps investing every year until he’s 65, for a total of $140,000. When they both retire at 65, Joe has $1,863,287 and Bob has $1,589,733. Because Joe started earlier, he invested $112,000 less, yet he earned $273,554 more than Bob! This is because of the power of compound interest. In 2018, the maximum annual 401k contribution allowed will be $18,500. Imagine being a 16 year-old teen living at home and being able to invest that amount annually for 5 years. You could have over a million before you were 45! So what are you waiting for? Go and take steps to establish your retirement nest egg today, because you’re not getting any younger! As always I wish you happiness and success! Author instantcoffeewisdomPosted on November 19, 2017 November 19, 2017 Tags 401k, debt, finance, happiness, money, self help, self improvement, success1 Comment on Who wants to be a millionaire? The Best Part of Waking Up ! Could I have a little more coffee in my coffee? By now, you may have been wondering about the title of my weekly blog. Instant Coffee Wisdom seems counter intuitive but I chose that name for two reasons. First it’s a bit of a play on words. Have you ever observed someone make a painful mistake that had an instant penalty? Like for instance, missing the nail when you swung the hammer and hitting your finger instead? Or maybe pulling a prank that backfired? I could go on, but the point in doing something like that is you instantly realize the error of your ways and take steps to ‘never do that again’. Some people refer to that as a dose of instant wisdom, or instant karma. Take your pick. Pain is a teacher and painful lessons are rarely forgotten. One thing I learned early on is that it’s much better to learn from the mistakes of others and avoid doing what they did. It was the driving force I used growing up poor that led to my current state of success. I’ve made a few mistakes along the way, and I’ve learned from them. I’ve also learned a lot by studying success experts, and their methods have helped me avoid many other errors. I’ve been poor and now I’m richer than everyone in my family, and most of my peers. Trust me, richer is better. Now I’m trying to distill what I’ve learned to help pass that knowledge unto you so that you too may grow and prosper. The reason it’s ‘lonely at the top’ is because so few strive to reach the peak of their potential. According to research by the University of Scranton, only 8% of people who set goals each year achieve them. 92% is a pretty large failure rate. Success takes work, and never happens instantly. So that covers the instant wisdom. Next up the instant coffee. Coffee is the most traded food or drink commodity in the world. The first successful method of creating a stable, soluble instant coffee was invented in 1901 by Japanese-American chemist Satori Kato. Growing up, my mother loved Taster’s Choice. I think Folgers has a better catch-phrase though it’s still inaccurate. The best part of waking up is not the coffee, especially if it’s instant coffee. The best part of waking up is waking up! Have you ever drank instant coffee? No matter what anyone says, instant coffee is NOT good coffee. It’s cheap, and it’s fast. You don’t need any equipment to make it. All you need is hot water, a cup and a spoon to stir it with. My mother never even boiled the water, just ran the hot water tap for a minute. It’s NOT good coffee, but as far as I’m concerned, even bad coffee is better than no coffee and you can kill the aftertaste with copious amounts of cream and sugar. Better coffee requires better beans, better roasts, fresh grinds, and better brewing methods. I’ve had many different kinds of coffee drinks in my life made by many different methods including the now popular cold brew method that’s sweeping the nation. One of my favorite methods for making coffee is campfire coffee, (also called cowboy coffee) which is boiled to perfection on an open flame. That’s one strong cup o’ joe that will put hair on your chest! I’m not even going to acknowledge hyper expensive exotic refinements like Kopi luwak or Black Ivory. You want to throw away a day’s pay or more for a cup of ‘so-called coffee’, go right ahead. That cup of coffee cost how much? I had my first cup of espresso in the 90’s at a long defunct cafe called The Munk’s Tunic. Needless to say it was a wake up call to a kid raised on instant. Compared to most ordinary restaurant coffee at the time, it cost twice as much, was severed in a tiny demitasse on matching sized saucer, with a sliver of lemon zest. From there I sampled cappuccinos, lattes, iced coffee drinks. It became quite the expensive drinking habit. I quickly realized that if this was going to become my new life-long obsession, I would need to start learning to make these drinks at home. So I brought my first espresso machine. It paid for itself the first year. Home espresso machines range in price from a $50 Mister Coffee, to certain Breville and De’Longhi models that run in the hundreds of dollars. Not one of them can hold a candle to a Nuova Simonelli Aurelia Semi-Auto Espresso Machine, but you’re not going to spend $9000 to buy one unless you are going into the cafe business. That’s why customers go to their favorite cafes, because you can’t get the same coffee at home. So the reason you actually buy lattes at cafes is because they have the specialized equipment, the training to operate it, and ‘hopefully’ the freshest beans available. And that’s why the coffee tastes so good. The very best coffee will never be instant coffee, and now you are wise to that. So think of Instant Coffee Wisdom as an easy reminder that the best things in life never happen instantly. Happiness, success, and wealth all take time to ‘brew’. Don’t settle for instant. There are no shortcuts to success, and if you settle for ‘good enough’, you are cheating yourself, because ‘good enough’ is NEVER ‘good enough’. As always I wish you happiness and success! 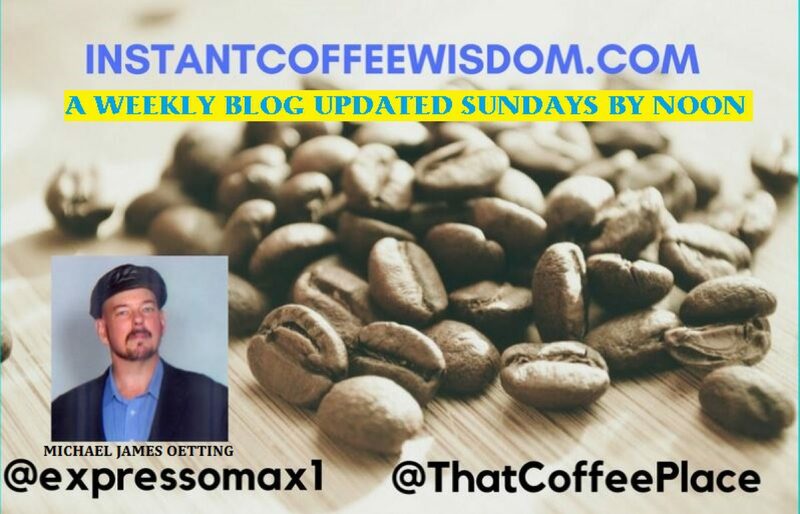 Author instantcoffeewisdomPosted on November 12, 2017 November 12, 2017 Tags coffee, debt, finance, happiness, money, self help, self improvementLeave a comment on The Best Part of Waking Up ! Live Boldly like you’ve never lived before! Are you living your life to its fullest potential? If the answer is no, what is stopping you? Life is not a dress rehearsal, we each get one life to live and it is up to us to get it right. We each must make our own decisions , and take responsibility for our actions. It’s very easy to blame others, or our circumstances, but ultimately it boils down to ‘the man in the mirror’. The good news is that as long as we have air in our lungs it’s not too late to make a change. First, decide what areas of your life you wish to improve. Everyone has at least ONE thing that they need to work on, and admitting it is half the battle. Write a list of goals you’d like to achieve in the coming year, then formulate a plan to achieve those goals. If it’s a very big goal, you may need to set smaller sub-goals. Then discipline yourself to do whatever is necessary to achieve those goals. Each day, motivate yourself to do something to get you further along your path to achieving success. Baby-steps are okay, small progress is still progress. Even two steps forward and one step back is progress. The key is consistency! Do not give up! As the old adage goes, “quitters never win, and winners never quit!”. Keep a chart of your progress to motivate you, and maintain a good attitude regardless of any small temporary setbacks which may occur. Rome wasn’t built in a day. Try to determine what went wrong, and why, then try again. Ask for help from more experienced individuals. Look for the positive part, and be thankful it wasn’t worse. Maintain a positive attitude and move on. Get into the habit of reading self-improvement books, and educational texts. We all enjoy a good novel, but if you’re only reading fiction, you are stunting your potential. You can become a leader in your field by spending one hour a day reading the latest information pertaining to your job. Leaders are readers! Studying a foreign language can make you more marketable. Learning new skills can lead to new careers and opportunities. The more skills you learn, the more knowledge you have, the more potential you unleash. With the exceptions of the day we are born, and the day we die, every day we live has exactly twenty-four hours, no more, no less. Successful people learn to maximize every second and are highly productive. Multitasking can be an effective tool, if and only if the tasks are complimentary. Conflicting goals lead to failure. Work during your peek times. Remember that trying to do too much at once will lead to burn-out. Remember, don’t quit. Self-improvement is a process. It will take time, it will take work. It’s not going to happen overnight. As long as you keep working at it, you will move further along the path to achieving your goals, and you will feel the satisfaction with each new milestone you reach. You can do it! As always, I believe in you, and wish you great success! Author instantcoffeewisdomPosted on November 5, 2017 November 6, 2017 Tags debt, finance, money, self help, self improvementLeave a comment on Be all that you can be! 404 – File Not Found! Have you ever been late for work because you couldn’t find your wallet or keys first thing in the morning? Everyday millions of people lose valuable time hunting for lost items. One of the key habits of highly successful people is that they’ve organized their lives for maximum efficiency. Get into the habit of always putting items away in a designated area as soon as you are done with that item. As soon as I walk into my home, I have a designated spot where I immediately place my keys, wallet, access badge, and hat, the moment I enter the door. I’ve made a habit of doing this for years. I never have to waste time looking for them, and it saves me unnecessary stress. This is an easy habit when you live alone, but it can be complicated if you have family, or roommates. In such cases you must make sure that the people you live with don’t mess with these. In the case of children or pets, it’s best to kept these items out of reach. All successful people are highly productive because they are organized and work from lists. Always work from a list and cross off items as they are completed. Keep lists of important items or tasks which must be done written down. Keep a grocery shopping list on the fridge with a magnet. Add items to it as you run low so you can take this list when you go shopping. Remember to start a new list after each shopping trip. Write important dates and appointments on a large monthly calendar, and refer to it each morning and evening. Keep a list of anniversaries and birthdays to add to new calendars and planners. Keep a personal planner book. Keep a fitness log to record your progress. Keep a list of important phone numbers and addresses. Print hard copies of important paperwork. Work from a clean desk! Never work from a cluttered desk, it cuts down on your efficiency significantly, and if you have visitors or coworkers, a messy desk makes you look very unprofessional. My work station is a model of efficiency. I have a file cabinet where I keep all my important papers such as tax returns, financial documents, newsletters I’ve written, and other personal papers. One cleaver file has copies of the mail-in portions all my recurring bills. Sometimes the post-office misdelivers or delays mail. It happens. I know when all my bills are due, and if I don’t receive my statement early enough, I make a copy from my file and mail that out. This avoids late fees. Keep in mind that whenever you file paperwork, 80% of the time it is never referred to again. Always think about what you are storing and why. If you are storing very old files that you haven’t looking at in years, you may want to consider transferring them from the file cabinet to the ‘circular file’ a.k.a the waste basket. Have you noticed I keep stressing the importance of physically writing things down? This is because electronics fail! There’s nothing wrong with keeping this info on your smart phone or laptop, but if these items break you will lose all your data. It’s even happened to me twice. When I was working on my first book 15 years ago, my hard drive crashed. I had a back up from the prior month, but recent work was trapped on the drive. Fortunately with some guidance from Frank Hayes of Computerworld and help from my pal Dan, we were able to recover the info by painstakingly searching the drive with a recovery program that worked, but took days! I was very lucky! I print an annual Christmas Newsletter which I circulate among close personal friends and family. One year, the computer files from the prior newsletter vanished into the ether. I keep hardcopies of every newsletter, but for some reason that year I neglected to put one in my file cabinet. Fortunately one friend and my aunt Joyce had copies so I did not lose anything. My late friend Harvey W. Kimble used to write all sorts of articles on his computer which he would print out and circulate among his friends. One day his daughter wiped his hard drive. Completely reformatted it. All his writing was gone, especially this one article which he was quite proud of. He asked friends and family if they still had copies. Believe it or not, I was the ONLY person who had copies of EVERY article he ever shared with me, and he was so grateful that he gave me $50! I tried to refuse, but he insisted. I miss Harvey, he always had a smile that lit up the room. When you organize your life, you simplify your life and free up time to live your life to the fullest! As always I wish you happiness and success! Author instantcoffeewisdomPosted on October 29, 2017 October 29, 2017 Tags debt, finance, money, self help, self improvementLeave a comment on 404 – File Not Found! Life happens when you least expect it! You live life best when you’re prepared for the worst. As I stated last blog the debt situation in the USA is at an all time high because people use credit cards for things they don’t need. But what if there’s an emergency? The average person today has no savings in place for the unexpected should it occur. They just think ‘oh no, not again!’ and just dejectedly swipe their ‘magic money card’. This usually makes the situation worse when the next unexpected event occurs. Trust me I know! From November 1999 through January 2002 I got hit with one disaster after another and I could not recover fast enough to prepare for the next time. I began to associate myself with the Biblical figure Job. The main time to prepare for an emergency is before it happens, NOT after it’s occurred. According to a 2017 GoBankingRates survey, 57 percent of Americans have less than $1,000 in their savings accounts, and 39 percent have no savings at all. This is very foolish because without an emergency fund, you only have credit cards to fall back on, and each time you dig yourself deeper and deeper into debt. As your financial situation deteriorates, your FICO score drops, the amount of credit available decreases, and the interest rates of those willing to extend credit to you (if any) quickly skyrockets. Trust me, it’s not a good feeling when you have no cash, your credit cards are over the limit and declined, and the bank won’t loan you money. It’s demoralizing to have to borrow money from friends. It felt awful, and a few of them made me feel rotten for having to do it. The lowest point was when I was still struggling and omitted the sad fact that I had no money for my share of the hotel during a planned trip to Canada in 2003 while we were driving to Canada! We were an hour from the border when I finally confessed the ‘bad news’. It almost destroyed our friendship. I promised Lawrence I’d pay him back in a month. Fortunately I am a man of my word and I’ve never reneged on a loan from a friend. After I clawed my way back up to prosperity from my pit of despair, I lost several other friends because I tried to help them with personal ‘loans’ which they NEVER paid back. Loaning money to your friends and family is a terrible idea. Just like you are the only person who can fix your problems, they are the only ones who can decide to change their ways and fix their problems. I want all my friends to be happy and successful, but they are the only ones who can decide if they want to be. This is where having an emergency fund will keep you from being knocked to the ground the next time an ill-wind blows your way. The Emergency Fund-Your first line of defense! First off, your 401k retirement plan is NOT an emergency account, and I’ll discuss 401k’s and why you must have one in a future blog. There are two types of emergency funds: cash and resources. Both are very important. Both take time to build. Consider the devastation caused by hurricanes Harvey, Irma and Maria in 2017, as well as past hurricanes like Andrew, Katrina and Sandy to name a few. Electricity was knocked out for weeks or even months. Buildings were destroyed. People went hungry due to lack of food and water. Medical supplies were short or non-existent. In your home you should always keep a rotating stock of groceries. Not just frozen or refrigerated goods. These spoil fast when the electricity is off. You should have about a month’s supply of canned and dry food, as well as a few cases of drinking water. I would also recommend a supply of basic medical needs. Survivalist preppers will go way overboard and claim you need a year’s supply of everything, but that’s overkill. A month’s supply is more than the average person needs, and keep it rotated! New foodstuffs in back, oldest items up front to be used first! Expired groceries do not help anyone. If you have to evacuate an area, I’d also recommend having a bug-out bag that you can grab as you load your car. I’d Google bug-out bags and emergency preparedness suggestions for more info to tailor needs for your unique situation. You’ve got to have a supply of ready cash on hand. Remember what I just said about no electricity after power lines go down from a hurricane or similar disaster? You can’t use an ATM or swipe a credit card with no electricity. If the power’s out for days what will you do? Cash is king! I recommend always having $1000 physically on hand in your home. Keep it hidden of course, but have it! It could be the difference between life and death. If you’re living paycheck to paycheck, drowning in debt, this could take you a few months, but it’s imperative that you start saving towards it, even if it means putting pocket change in a mason jar on the kitchen counter after work each day. Once you’ve gotten the emergency fund started with the $1000 in cash, you should next work on beefing-up your bank savings account. A good rule of thumb is to have three to six months of living expenses , or $5000 (whichever is greater) saved. Once you’ve achieved that benchmark, you want to keep building your savings until you have saved up two year’s worth of living expenses. It’s easy to do if you’re debt-free and living modestly and within your means. I actually pay my rent by the year now. It’s a great feeling to know that my highest financial obligation is taken care of for 12 months, I’m debt free, I’ve got plenty of food and resources, and life is good! As always I wish you happiness and success! Author instantcoffeewisdomPosted on October 22, 2017 October 22, 2017 Tags debt, finance, money, self help, self improvement5 Comments on Oh No, not again!